BANGI, 14 Sept 2012 – Stories of his countrymen living in the remote areas of Bangladesh who have handphones but are not able to charge them due to non-availability of electricity touched Dr Nowshad Amin. The Associate Professor from the Electrical, Electronics and Systems Engineering Department of The National University of Malaysia (UKM) resolved to produce a cheap solar powered charger – thus the creation of the mini solar charger, Greenfinity TM. The equipment measuring 19 centimeter x 36.5 centimeter use solar energy not only to charge handphones but the reneweable energy kept in its small battery can be used to light up night lamps. It can also supply electricity needed to operate small electronics gadgets. About 500 pieces have already been sold mostly in Bangladesh at a price of RM150. Villagers in Bangladesh currently needed to go to the nearest city where there is electricity to charge their phone batteries for which they are charged 10 Bangladeshi Taka for an hour of usage. Using the solar charger villagers could save an amount equivalent to the cost of half a kg of rice. The portable solar charger can directly charge up to two mobile phones at once taking around 2 1/2 hours to fully-charge them or one hour if only one is being charged. The charger can charge through different connectors including USB. It has an extra port of crocodile clip for charging external chargeable 6 volt storage batteries. The user can thus enjoy the stored electricity at night to turn on any lamp or any other electronic appliances with 6 volt power. It makes use of solid state electronics and passive components, which makes the charger durable and generates nearly zero signal interference to the mobile phone. Its solar panel is a 5Wp poly crystalline silicon solar panel with a portable size of 19cm x 36.5cm certified by TUV, with a warranty of over 20 years. The electronic controller on the back of the panel have a five year warranty. The GreenfinityTM solar charger in convenient and provides clean energy with zero greenhouse gas emission. 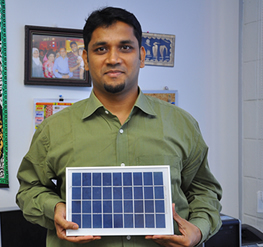 For the first batch, Dr Nowshad plans to produce at least 5000 units of the solar charger to be sold in developing countries such as Bangladesh, Cambodia, Laos, Myanmar, India, Saudi Arabia and in Sabah, Sarawak and Pahang for use in remote areas not connected to the national electricity grid. It carries a one year limited warranty against defects in workmanship and materials affecting performance. They have submitted for a Malaysian patent (given the number PI2011000346) for the “Greenfinity Solar Charger” on 25 Jan 2011. He is planning to produce a second generation solar charger that can be used to charge laptops. It is slightly bigger than an A4 size paper, the size of an eleven inch notebook. Its price ranges from RM180 to RM250 depending on the country where it is sold. 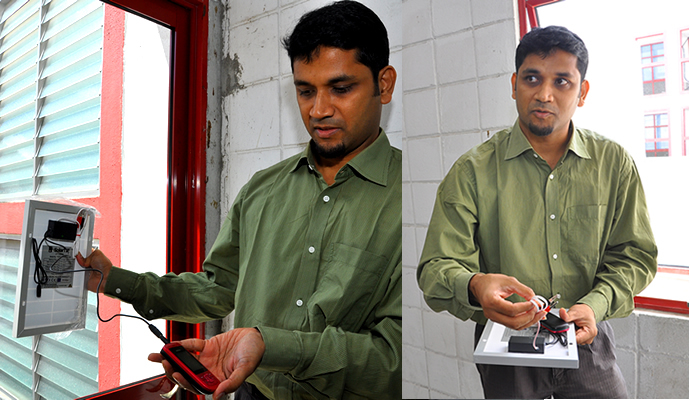 Dr Nowshad who have experience in product design have already developed its design together with his team. “Our main focus is to market the product online as it would enable us to focus on the customers”. Dr Nowshad have a Master’s degree in Product Design and Manufacturing. He obtained his PhD from the Japanese Technical Institute and a Post Doctoral qualification from US. He has recently received RM500,000 from the Cradle Fund to develop and commercialise the 2nd generation solar charger. Dr Nowshad who has been lecturing at UKM for five years still maintained strong ties with his country of origin. “Those of us who have succeeded and live a comfortable life overseas will always help our brothers who wish to further their studies. We banded together to form a foundation to help them,” he said. What prompted him was the violent typhoon which destroyed thousands of houses and properties of Bangladeshis in 1990’s while he was studying in Japan. With some money which he saved Dr Nowshad and his father took the initiative to form the education foundation. Dr Nowshad considers himself lucky to be selected from among students who excelled in their examinations and sent for further studies with a bursary from the Japanese Goverment.